By Candles Off Main, Contributor Lynette Reed: Fragrance fanatic, founder of Illume Candles, Izzy Sayan Perfume, Fluid Fragrances, and creative consultant to many high-end fragrance brands. There is a special place in my heart for Linnea’s Lights candles. When I lived in Seattle, I opened a small store filled with good-smelly things, and Linnea’s Lights was one of my favorite brands to sell. Not only were their candles an easy sell because all a customer had to do was take a whiff and they were sold, but I loved to take them home on a regular basis and enjoy them in my own space. Linnea’s Lights was relatively new back then, and it makes me happy to see how they have expanded their collection and established their place in the vast candle market. 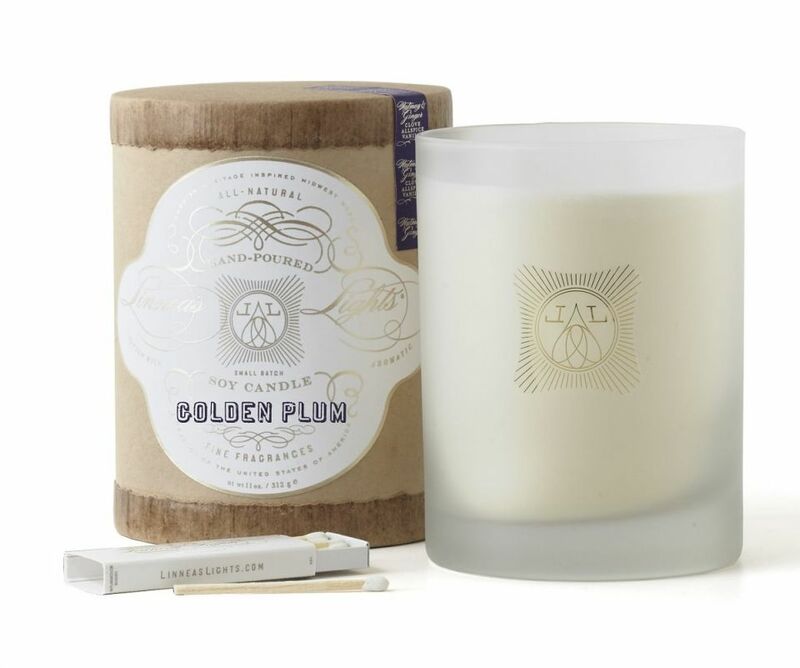 Linnea’s Lights candles are hand-poured with a pure, all-natural soy wax using fine fragrances and Golden Plum is certainly one fine fragrance! Described as Velvet Plum, Honey & Cardamom, I would say it’s all that and more. The fragrance is soft and sweet but with a slight spice and a powerful warm throw. Maybe it’s the effect of the double wick that gives the throw an extra boost, but it took over my kitchen very quickly and meandered into other rooms in my place quite unexpectedly. Needless to say, I now have a new Linnea’s Lights favorite! Be sure to try some of the other scents in the collection, Forest Fir, Cashmere, Winter are a few of my favorites this time of year, and of course no one can beat their Pumpkin, which for me is hands down the best pumpkin candle on the market.